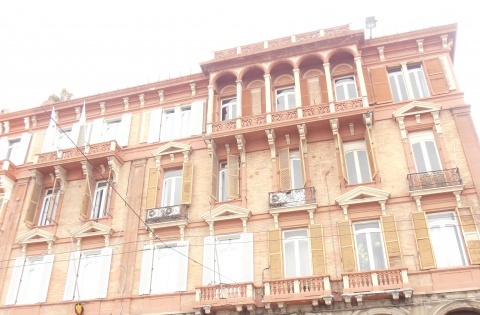 The so called “Palazzata” (Palace) runs along the seafront and overlooks one of the best known and most central streets of Cagliari, Via Roma that bounds the historic district of Marina. These buildings have replaced the fortifications, formerly based on the ramparts of Saint Augustine (today crossing with Largo Carlo Felice), and the dock (at the corner of Viale Regina Margherita) demolished in 1863. These big palaces are formed by arcaded buildings that stand out for the combination of different decorative styles such as that one of the Renaissance and Art Nouveau. In 1870, Via Roma was known as “Via San Francesco ”, and consisted of a series of small houses on the ground floor and first floor where families of workers and seafarers used to live. A row of houses was also located close to the pier bastions. They were public housing whose lower floors were occupied by small shops or popular trattorias. The construction of the port, was preceded by the demolition of those houses next to the dock in 1881. In the area where the Rinascente palace was built, there was the building of the Iris cinema, and some large factories, later transferred to the outskirts of the town. After the Rinascente palace, we find the porticoed buildings constituting the “Palazzata”( an Italian word to define a series of palaces close to each other): the Magnini palaces built between 1894 and 1895 next to Baylle street; the Putzu-Spano palace dated back to the thirties; the Garzia palace built between 1894 and 1905 delimited by Via Napoli and Via Barcelona; ​​the Lione-Manca building erected between 1924 and 1934, it was the location of the Olympia cinema. The Devoto palace built in 1870 close to the church of San Francesco di Paola, and Vascellari Beretta mansion, located between Via Lepanto and Via Concezione. At the end of these palaces, the Regional Council, the Ravenna building dated back to 1910 and the INA palace built in the fifties, which has taken the place of Zamberletti palace destroyed during the bombing in 1943.